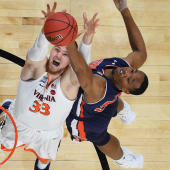 The ACC dominated the final AP Top 25 Poll ahead of the 2019 NCAA Tournament, with Duke, Virginia and North Carolina -- all teams that clinched No. 1 seeds on Selection Sunday -- sitting atop the fresh rankings released on Monday. Duke jumped four spots from No. 5 to No. 1 thanks to a perfect week at the ACC Tournament in which it knocked out Syracuse, North Carolina and Florida State en route to winning the championship with a healthy Zion Williamson. The Blue Devils garnered 58 of a possible 64 first-place votes. Virginia received five first-place votes while North Carolina received none. Gonzaga, which sat atop the rankings for four weeks, garnered one first-place vote despite falling to Saint Mary's in the WCC Tournament this week.